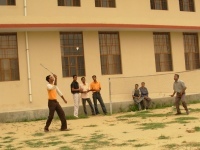 The College encourages the students for sports. An inter-house competition is conducted and winners are awarded with prizes. Apart from this a large number of Athletic items namely discuss throws, javelin, shot put etc for both boys and girls are also organized. As such the College has setup Gymnasium for students to ensure their fitness and a variety of indoor and outdoor games like Table Tennis, Badminton, Cricket, Volleyball, Basket Ball, Kho-Kho and athletics / throws etc. College maintains a standard GYMNASIUM catering to the needs of interested students and GYM coach (D.P.E.) is there to guide and instruct them. The shot, a metal ball (7.26kg/16lb for men, 4kg for women), is put – not thrown- with one hand. The aim is to put it as far as possible from a 7ft-diameter (2.135m) circle that has a curved 10cm-high toe-board at the front. In order for the put to be measured, the shot must not drop below the line of the athlete’s shoulders at any stage of the put and must land inside a designated 35-degree sector. 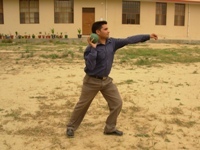 The athlete, meanwhile, must not touch the top of the toe-board during their put or leave the circle before the ball has landed, and then only from the rear half of the circle. Athletes will commonly throw four or six times per competition. In the event of a tie, the winner will be the athlete with the next best effort. 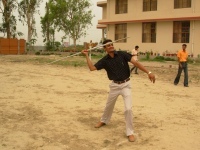 Using one arm, a metal-tipped javelin is thrown as far as possible. The athlete must hold the javelin by its corded grip with his or her little finger closest to the tip of the implement. The men’s javelin must weigh at least 800g and be 2.6m-2.7m long while the women’s javelin must weigh 600g and be 2.2m-2.3m long. For the throw to be measured the athlete must not turn his or her back to the landing area at any stage during their approach and throw; they must throw the javelin over the upper part of their throwing arm; and they must not cross the foul line, aka scratch line, at any time. The javelin must also land tip first and within the marked 29-degree sector. If the tip touches the ground first the throw is measured from this point. Athletes will commonly throw four or six times per competition. In the event of a tie, the winner will be the athlete with the next best effort.